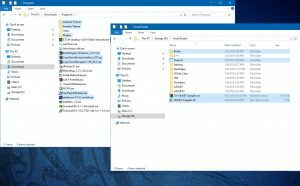 Whenever I needed to copy multiple files from multiple folders, what I normally had to do was copy the files from one folder then paste it to the destination. Only after the process had finished would I copy and paste files again from a different folder. This was easy and simple enough. But what if you were dealing with thousands of large files from multiple folders? You’d have to monitor the first transfer and wait until it finishes before doing the next one. It was just inconvenient. Sure, you can copy and paste again even before the first operation had finished but that seems inelegant since now you would have multiple processes trying to paste files simultaneously instead of dealing with them first come first serve aka FIFO in computing. This is especially inelegant if your target destination is a thumb drive which has a lower I/O. In the example image above, let’s say you need to copy some items from both the “Programs” folder in drive C:\ and the “Visual Studio” folder in drive D:\ then paste the items into an external thumb drive. 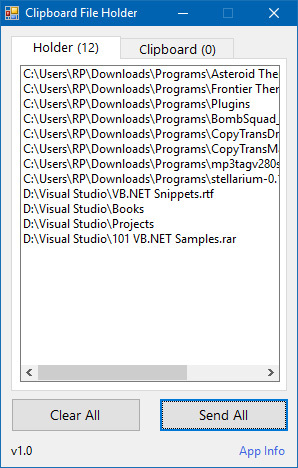 What you usually had to do was copy the items from the first folder (“Programs”) then paste them into your target destination, wait for it to finish, then do the process again for the remaining folder(s) (“Visual Studio”). Drag your desired Files and/or Folders into the Holder Tab. Click “Send All”. This sends the location of the items to the clipboard. Right-click on the destination then select Paste or the classic Ctrl + V.
I understand that this might be a niche tool that is only useful for me, but still, someone out there may find a need for it so I share it here. Questions and suggestions are welcome. Write your comments below.